S71T Plus Action Camera is able to capture Full 4K at 15 fps, 2.7K at 30 fps, and 1080P at 60 fps, 16MP photos, burst shooting up to 8 photos/sec, time-lapse, G-sensor, modular 2" TFT LCD screen, Wi-Fi wristband remote and various other features in a lightweight package. Perfect for action sports and other activities to capture dynamic footage. 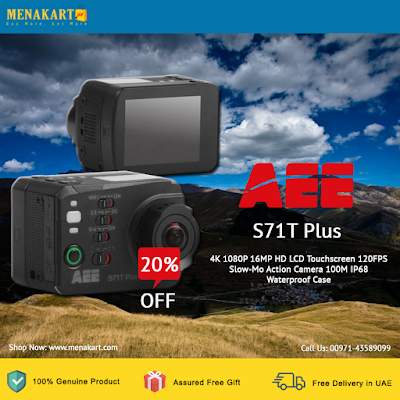 Wi-Fi enabled with free mobile app for ultimate versatility, digital zoom, 180 degree image flip, 160 degree wide angle, and included 100m Professional waterproof case for the ultimate action camera packed full with useful accessories and features. Stunning HD 4K video resolution, 16 MP still images, 2.7K30fps, 1080p60fps, 720p120fps, slow-mo, burst shooting, time-lapse, up to 150 degree ultra wide angle, 10X digital zoom for the ultimate action camera experience. Includes detachable 2" Touchscreen Display, IP68 waterproof housing dive depth of up to 328 ft. (100 meters!). Supports up to 64GB micro SD card storage, Wi-Fi capable with mobile APP (iOS and Android) for easy shot preview and playback. 4K/2.7K/1080P/720P Video Resolutions, 16/12/8 MP picture stills and 1080P/60FPS, 720P/120FPS dynamic shooting. Burst Shooting up to 10/sec, G-Sensor motion detection auto capture, long 2.5 hr. record time, 180 degree image flip. Select-able viewing angle up to 150 degrees. F2.8 Aperture, MP4/WAV output format, 1500mAH battery capacity, 328 ft. max Wi-Fi range, USB port (mini 10pin), thin 1.25" camera profile (without screen), ultra light weight 0.19 lbs. (without screen).